It's important that your rat is fed a balanced and nutritious diet. You'll find rats will eat most things you give them, but just like us humans, that doesn't mean they should. They have fairly specific nutrional requirements in order to stay healthy and in peak condition. Rats are omnivores, and generally need their diet to be about 75- 80% carbohydrates, 12 - 20 % protein (too much protein can cause your rat to itch, causing scabs), and around 4 - 6% of fat. Unfortunately there aren't a lot of good rat mix options available in NZ shops. Most grain mixes that you find at your local pet store aren't recommended as they usually have a high corn and seed content, as well as alfalfa pellets. Dried corn can contain high levels of mold and fungus which isn't healthy for your rat, and is known to be carcinogenic, the seeds in these mixes are usually too fatty, and alfalfa pellets can't be digested by rats. Lab Blocks are a great diet choice for rats, but unfortunately they can be hard to find in NZ. Two brands you can get in NZ is Diet 86, a locally made lab block, and Harlan Teklad #2018, #2016 and #2014 lab blocks. Another option is to make your own mix. 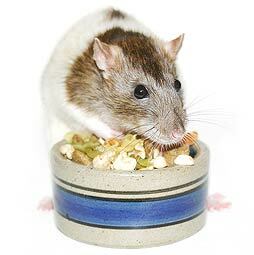 There are several good nutritious rat diets that you can make yourself. Some of the better known ones are Debbie Ds Diet, Suebee's Diet, and the Dapper Rat Diet. They all take a little bit of work to make, but once you've made them, they can last 2 to 3 months. Make sure you supplement your rat's diet with fresh fruit and vegetables on a daily basis. Especially popular among rats are peas, carrot, fresh corn, avocado, (high in fat, so only in moderation), cucumber, broccoli, cauliflower, cooked sweet potatoes, grapes, blueberries, banana. A little bit of cooked chicken, chicken bones (rats gnaw rather than chew so bones are perfectly safe), pasta, rice, couscous, and any healthy leftovers can also be fed to your rats for extra variety - rats LOVE variety. Olive or flaxseed oil on wheat bread a couple of times a week also keeps the rat's fur in good condition, and they enjoy it. The oil is especially helpful in reducing the amount of buck grease intact males produce. Water should be offered to them in a water bottle, for hygiene reasons. This is probably the ONE thing that every pet shop in NZ will stock in various sizes. Make sure the water bottle is within easy access for the rats, especially for older rats who aren't as mobile as they used to be. Having two water bottles available for the rats is also a good idea - if one bottle runs out or gets stuck there is another source of water available until the problem is fixed. - Yoghurt drops, choc chips (chocolate isn't poisonous to rats) and yoghurt covered raisins. Here's a great treat you can make yourself, is easy to make, and can store in an airtight container. A big thank you to Liza for sharing it. Preheat oven to 175 celcius. Combine wet ingredients and add to dry flour mixture. Knead together until dough is stiff. Roll out dough to 1/4" thickness. Cut with cookie cutter. Bake for 20 minutes. Turn off heat and let cookies dry in oven until cool. Just like you and me, rats can eat most things; however there are a few exceptions. Orange Juice - forbidden for male rats only, the d-limonene in the skin oil can cause cancer. Mango - also forbiddon for male rats only, due to the d-limonene in the flesh. Sticky foods such as Peanut Butter, some Candy, and Dried Fruits - poses a choking hazard. Peanut butter can be "cut" with jam or honey to make it more liquid, and reduce the possibility of choking. Seaweed - the seaweed the comes on sushi or in soup poses a choking hazard. Carbonated beverages. Rats can't burp, so drinking them can cause discomfort. Dried corn. Contains fungus known to cause cancer in rats, so limit the amount you give them. Some fresh corn is ok in moderation. Rats are also extremely inquisitive, and will try and taste most things, including things that aren't food. Be careful with what you leave lying around. They have been known to get into felt tip pens, moisturisers, and soap. Basically, if it smells interesting, they'll try it! © 2006 ratclub.org. All rights reserved.